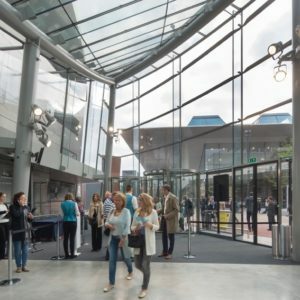 2,100,000 Visitors a year are entering and exiting out the Van Gogh Museum through the Bauporte revolving doors. We developed these full transparent burglar proof revolving doors, achieving class RC2 resistance compliant to the EN 1627 standard. 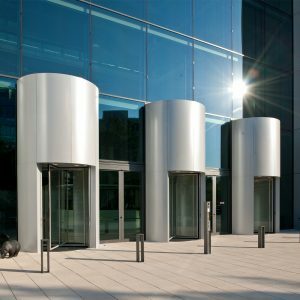 Due to fire regulations the clients and architects needed a revolving glass fire resistant door, requiring a special solution owing to the 3.6m height of the door. 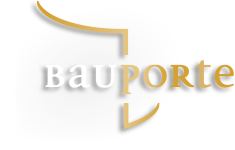 Bauporte worked with two glass companies to produce a 30-minute fireproof glass solution. "I was searching for a company that could make this one-of-a-kind door and that's where Bauporte came in. 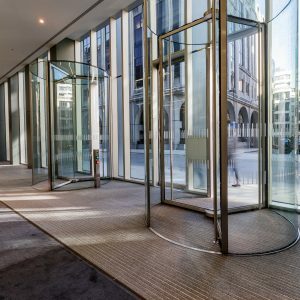 Bauporte has designed and supplied a bespoke office entrance to 6 Bevis Marks in London, with three tall revolving doors and full vision pass doors. 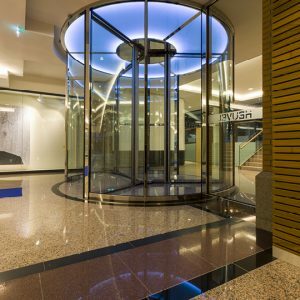 The leading architects site Archello writes a project review about the eye catching Borse Cube revolving doors.